Dr. Rothenberg provides expert dental implants for patients in the greater Boston, MA area. To learn more about our services and schedule an appointment, please call us today at 781-639-2585. Dental implants can replace a single missing tooth or multiple missing teeth. Either way, the implant is made of biocompatible titanium, which is inserted into the jawbone. Over the next four to six months, the implant osseointegrates, or fuses, with the bone, creating a strong and stable replacement for the tooth root. An abutment post is then used to attach the final restoration to the implant. If you are missing multiple teeth, an implant-supported bridge, removable implant-supported denture, or fixed implant-supported denture could be a solution. An implant-supported bridge is anchored by an implant at each end, with pontics, or synthetic teeth, in between. If you are missing a few teeth in a row, this is a great option. A removable implant-supported denture can be secured by just two implants. Rather than relying on denture paste or adhesive, the denture simply snaps onto the implants for stability. It can still be removed for sleeping or cleaning. A fixed implant-supported denture is securely attached to a set of precisely placed dental implants. As the name suggests, it is not removable. This is the most natural option, and it restores nearly all of your original bite strength. If you have extensive bone loss, a customized milled bar may be used to firmly secure the implants to each other. Most patients claim that receiving dental implants hurts less than having a tooth pulled. We use local anesthesia during the placement process, and any lingering soreness generally responds well to over-the-counter pain medication such as Advil or Tylenol. If you have any pain that lasts for more than a couple of days, call our office. Every patient is different, and we customize our treatment plans to meet the needs of each patient. Dr. Rothenberg will perform a thorough evaluation and make recommendations based on the results. For the majority of patients who are missing teeth, though, dental implants are a long-lasting, durable, and highly aesthetic solution for restoring their smiles. Many dental insurance plans now cover dental implants, and we offer different financing options. Do not assume that dental implants are out of your reach financially. Call us to see how we can help. Dr. Rothenberg is proud to announce his peers have named his office one of the Leading Implant Centers not only in the Boston area, but around the world. This prestigious award is only given to a handful of Implantologists who have the highest levels of certification and training and specialize in dental implantology. If you are in the Boston area and require dental implants please contact our office so that we can help. The editors of Spiegel got straight to the point of what the internet portal Leading Implant Centers successfully fights for in the implantology market for over a year. Due to lacking transparency in the clutter of dental training for implantologists, most patients are unaware which education they can trust and whether or not the dental specialist is certified. Leading Implant Centers is the only internet platform that entered the market exactly for this reason: to create transparency for the patients and to ask for a high standard for the further training of dental specialists as implantologists. As Spiegel reports, trained dental specialists decorate and adorn themselves with degrees such as Curriculum or other non-transparent certificates that are not distinguishable for patients. The internet platform Leading Implant Centers offers a solution. All members are dental specialists within the field of implantology and are quality-wise on the highest education and certification level of the specific scientific dental associations. Dr. Donald Rothenberg from Marblehead in USA has been accepted to join Leading Implant Centers, since he fulfills all the criteria for a membership. “We want to ensure safety for the patient” explain the founders of Leading Implant Centers. “Therefore it was a must for the founders of the portal one year ago that a scientific advisory board of worldwide renowned implantologists, who also partially hold roles with the international scientific professional societies, reviews and ensures the qualitative contents of the portal and also ensures the systematic examination of the applications for admission of implantologists to the portal.”With all criticism about the confusion of the training of implantologists, implanted dentures offer many advantages for patients, these can be of medical, masticatory and especially esthetical nature. Often a tooth replacement with a single tooth implant is very pleasant as compared to a bridge, the interdental spaces can be flossed and the neighboring teeth do not need to be ground. This enables a more sustainable tooth preservation. Not only should a good implantologist have a good education, he should explain the purpose for which he wants to utilize implants, creates transparency for the costs and explains the opportunities and risks of the intervention, but also provides alternatives to implantation. He works with the consciousness of being capable to offer an optimal and individually optimized dentistry. A basis of trust between implantologist and patient is also important for the success of the treatment as healing and success of a medical intervention can only take place in an atmosphere of trust. Therefore, the active co-operation and willingness to provide information is asked of the patient. Only then can the dental specialist decide if for example an anxiety treatment for the patient is necessary. In Germany, patients expect a high professional expertise of their dental specialist and this fact usually leads to a commitment for the implantologist.The founders of Leading Implant Centers act for the long term. They are establishing a worldwide network of qualified implantologists to offer patients an extensive network of well trained implantologists and to implement the training and education for implantologists at the highest level of education as the standard. Find the closest implantologist you trust in your vicinity. Dr. Donald Rothenberg from Marblehead. MA in the USA belongs to this small circle, he is an expert you can trust and stands for dental excellence on the highest level – guaranteed. Suddenly you need new teeth. Leading Implant Centers carefully examines Implantologists. Implants achieve more than just beautiful teeth. Next to esthetics, implants also restore the important chewing function. But how can I find a reliable implantologist? The internet portal Leading Implant Centers offers patients a reliable platform with experts in implantology who are verifiably certified to the highest level. With a sophisticated search function, patients can nationally and internationally find the closest implantologist in a user defined radius of a selected location. Dr. Donald Rothenberg is a competent contact in your region. How do I find a competent implantologist in case of a tooth replacement? Who can answer all my questions about dental implants beforehand? The internet portal and every member listed on it offers detailed information to the treatment procedure and its risks and possibilities. In your locality there is Dr. Donald Rothenberg a verifiable expert of oral implantology. He has qualified as a member of Leading Implant Centers due to his expertise and experience. Before any implantological treatment the following aspects need to be analyzed: Hard (bones) and soft tissue (gum) of the concerned patient, the implantological areas as well as functional and esthetical parameters such as chewing pattern and position of neighboring teeth. It is ideal for the patient if the whole treatment – from the diagnosis to the finished implant – is executed by a certified implantologist or a team of implantologists, as is for example the case with the practice of Dr. Donald Rothenberg. As certified implantologists act on the principles of carefulness before speed; factual information and sensitive discussions to eliminate a patient’s fears of the procedure. Leading Implant Centers researches, verifies and looks closely when it comes to the admission of a trained and certified implantologist to the portal. Leading Implant Centers is backed up by a scientific advisory ￼board of worldwide leading implantologists who also partially hold roles with the international scientific professional societies. The practice of Dr. Donald Rothenberg from Marblehead in Massachusetts/USA meets its strict entry criteria and has been appointed as a member. 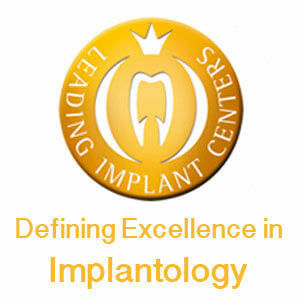 For more information on Leading Implant Centers, please go to http://www.leadingimplantcenters.com/en/home/.